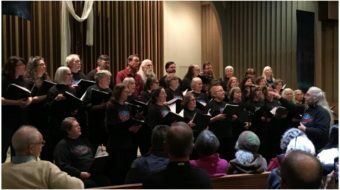 WASHINGTON — Thousands of union members and ordinary citizens massed on Capitol Hill on Thursday to make their voices heard for a progressive health care reform with a public option. Labor’s major role in organizing this rally and in fighting for health care for all was clearly shown by the massive display of color-coordinated T-shirts of the unions participating. AFSCME, Communications Workers of America, International Brotherhood of Electrial Workers, Steelworkers, Laborers’ International, United Food and Commercial Workers, SEIU and Labor Coalition for Latin American Advancement members arrived from every corner of the country and marched to Upper Senate Park, where a spectacular view of the dome of the Capitol building was the background for the speakers at the rally. Labor contingents were joined by many other organizations including seniors groups, supporters of single-payer government financing, Planned Parenthood and many others. In spite of the blazing sun and 90 degree heat, participants enthusiastically clapped and stamped to the cheer “We want health care — Now!”. * Whether there will be a major government provided alternative to cover the 47 million-plus people who don’t have health care at all, and the several millions more who are inadequately covered by private insurance. The insurance industry is fighting hard through its front-people in Congress to remove the public option supported by President Obama, and replace it with vaguely defined ‘co-ops.’ The thousands in Upper Senate Park made it clear that they are determined to have a public option, whether the insurance industry likes it or not. * Whether employees’ current health care benefits are going to be taxed or not. The labor movement is strongly opposing taxing benefits. “The first person who proposed national health care was Theodore Roosevelt, 100 years ago …we’re not going to wait another 50 years, we’re not going to wait another year”. These sentiments were echoed by actress Edie Falco, who pointed to the Capitol building behind her and said, “It’s time to make THEM sweat.’ Falco then introduced several ordinary working people who told shocking stories about how the current non-system of financing health care has affected them and their families. Maureen Kurtek, from Pennsylvania, who suffers from lupus, recounted how she had lost parts of her hands and feet due to a delay by her private insurance in agreeing to cover treatments she needed. AFSCME President Gerald McEntee blasted the insurance industry for scuttling the attempt at health care reform at the beginning of the 1990s with their famous and misleading “Harry and Louise” paid commercials on TV. Other speakers also denounced the political role of the insurance industry as one of the chief obstacles to reform. After the rally, the thousands of workers headed for Senate and House office buildings to lobby Congress to support their demands.